A 1 will appear on any of the three dials. A 0 will appear on any of the three dials. The total of the three dials will be odd. The total of the three dials will be even. It’s all very straightforward, which I’m sure many will consider to be a downside. The best features of Digit are its speed and accumulating wins, but even then you still feel as though something is lacking. Digit fun rating - 53%. With its limited wagering options, Digit is not going to appeal to those of you that like variety with your fixed odds guessing games. Furthermore, the fact that there is so little to bet on means that the payouts are restricted to either tiny or small wins in each round. Sometimes you just want to go balls to the walls and bet on an incredibly unlikely outcome for the chance to win a stupid amount of money. Unfortunately, the "balls to the walls" option has not been included in Digit. The redeeming aspects of Digit though as mentioned are its speed and the ability to build some massive accumulating wins (if you have the patience). Results are almost instant and you can gamble on outcomes from one round to the next in seconds. Digit, like all good accumulating win games, has the ability to give you the resting heart rate of a hummingbird on cocaine. However, I’d much rather play a much more entertaining accumulator game from the HiLo section like HiLo Gambler or Golden 7s instead. Wager on one of the four different betting options. Collect your winnings (if any) or gamble them for bigger wins on future rounds. There are no restrictions on how many rounds you can play (unless you’re coming close to winning over the maximum win for the game). If you’re lucky enough to win on every round you can keep gambling and build a massive payout for yourself. Digit in a bit more detail. There are three digital dials in Digit. Each dial can display either a 1 or a 0, with each number being as likely to display as the other. 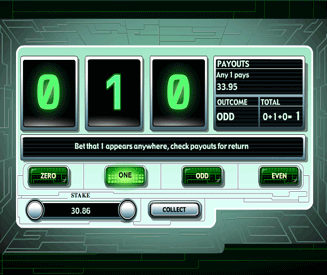 After you have placed your bet, each dial will display either a 1 or 0. Winning bets will then be paid, which can be gambled on the next round or collected. There are only four betting options in Digit. Zero = 1.1x. Wager on whether a 0 will appear on any of the three dials. One = 1.1x. Wager on whether a 1 will appear on any of the three dials. Odd = 1.95x. Wager on the total of the three dials being odd (e.g. 1 + 0 + 0). Even = 2.55x. Wager on the total of the three dials being even (e.g. 1 + 1 + 0). "Zero" and "One" have the exact same payouts, as the outcomes for each as just as likely. "Odd" and "Even" have different payouts, as it’s less likely for the total number to be even. This is because the result 0 + 0 + 0 does not payouts on "Even" bets, whereas 1 + 1 + 1 will payouts for "Odd" bets.